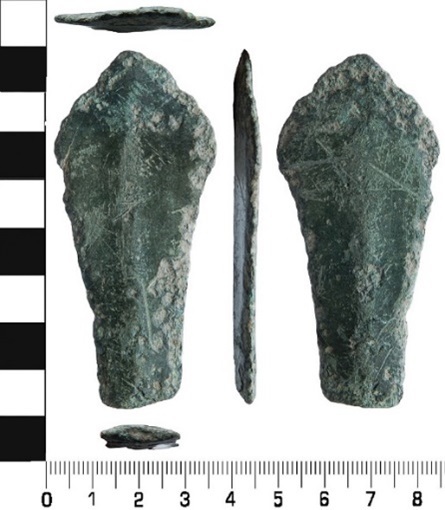 The fourteen individuals in this samples came from five sites in present-day Southern Germany. These were Manching-Oberstimm and Weichering, located both within 11 kilometers (7 miles) south of the city of Ingolstadt, Osofen-Altenmarkt, located 36 kilometers (23 miles) northwest of the city of Passau, Worms-Herrnsheim, located 38 kilometers (24 miles) southwest of Darmstadt, and Unterer Talweg, located in the southern suburbs of the city of Augsburg. All individuals were carbon-dated to between 4,000 and 4,500 years old. The site of Manching-Oberstimm consisted of four graves which were set out in rectangular wooden boxes. Included in the graves for all of these sites were copper daggers, copper awls, wrist plate, and several arrowheads, also ceramic vessels, bone buttons, and a cup [19-21]. Chemical analysis of teeth showed that some of the individuals were local and some not . The site of Worms-Herrnsheim contained multiple Bell Beaker burials, but not far to the south of this site was a lone burial of a child. This child was found to be genetically female and is one of the individuals in our sample. She was buried with an animal bone next to her head . 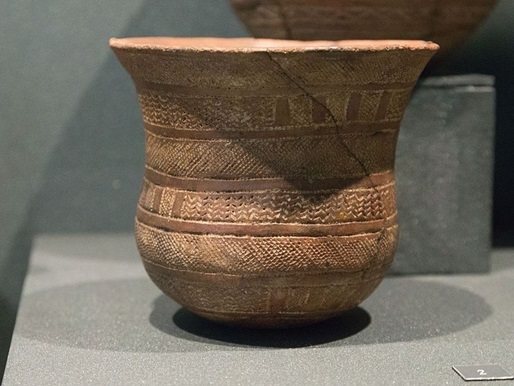 Genetic analysis has shown that these individuals had a strong connection to Yamnaya people from the east that migrated into Europe to form the Corded Ware and Bell Beaker Cultures . These migrations brought sweeping changes to the genetic map of Europe. While it was initially debated whether the Corded Ware cultures represented a diffusion of technology rather than a movement of people, recent genetic analysis has shown that large scale migration did occur into Eastern and Central Europe from the Pontic Steppe area of present-day Eastern Ukraine and Southern Russia [25-26]. Analysis of individuals specifically associated with the Bell Beaker Culture have not found a closer relationship between these individuals from different regions of Europe, suggesting that this culture was transmitted more as a cultural pattern rather than a separate people from the rest of the European population . Eleven individuals belonged to a mixture of mitochondrial haplogroups H, J, K, T, and V, all of which thought to have arrived in Europe from West Asia and the Caucuses region through steppe migrations. Their origins are mostly in the Paleolithic or Mesolithic and still exist among Europeans today [27-31]. Three belonged to the U mitochondrial haplogroup, which was the most common haplogroup among European hunter-gatherers of the Paleolithic and still exists in Europe today although at lower frequencies due to the genetic contribution of incoming European farmers . Four males in this sample belonged to the Y chromosome haplogroup R, which is a very ancient lineage thought to have arisen in Southeast Asia during the Paleolithic. It is widespread across the world today . One male belonged to the G haplogroup, which is thought to have Anatolian or Iranian origins and is found in Europe today . 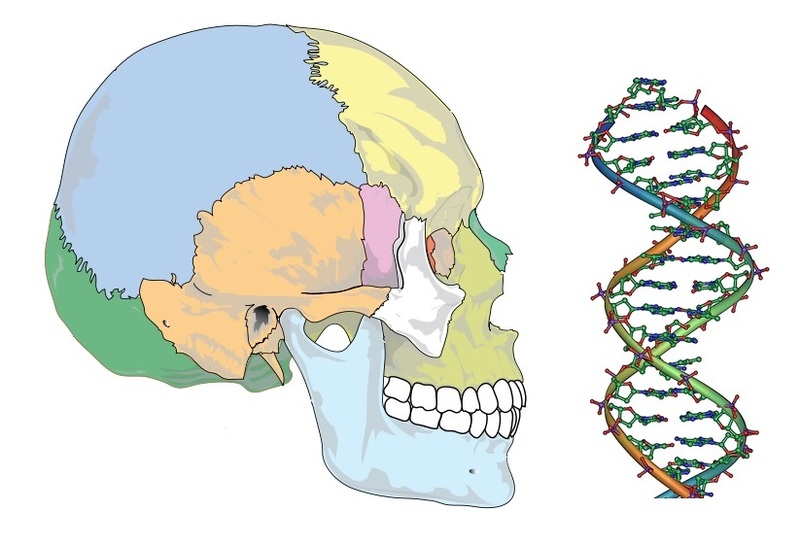 One male each belonged to the Y chromosome haplogroups CT, and BT, which are very ancient lineages common worldwide, and were thought to have originated in the Paleolithic [35-38].